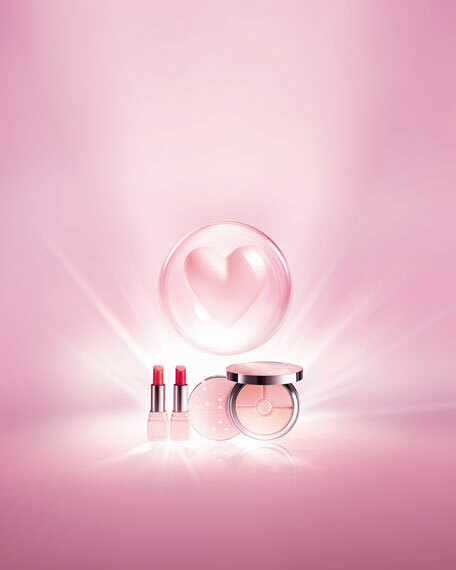 KissKiss LoveLove lipstick by Guerlain surprises us this spring, appearing in the form of a heart to lovingly shape lips, passionately enfold them and beautifully hug the cupid's bow. To mark the occasion, it comes in an exclusive pink case with rainbow accents and is available in five must-have shades. The perfect blend of colour and luminosity, KissKiss delivers flawless coverage to offer a vibrant, satiny finish with impeccable hold. Lips immediately regain their fullness and softness thanks to a formula enriched with plumping hyaluronic acid spheres. The presence of mango butter ensures that they remain hydrated and comfortable, while Commiphora oil helps to beautifully smooth the lip surface. Draw the shape of the lips with the Stylo Lévres. For in-store inquiries, use sku #2488218.